If you're a candle lover, here are a few links for you. I purchased this Macintosh Apple soy candle the other day from a Wagglepop seller and it's really nice too! I can even smell it in the room when it's not lit. She was super friendly and shipped immediately as well. Also, have you ever seen the Valerie Par Hill candles on QVC? They're made by Hannah's Candle company in Fayetteville, AR. Well some smart person figured out that the exact same candles are sold, much more affordably, at WalMart and Walgreen's! At Walmart they're in a mason type jar, and have no brand name on them. But if you look at the bottom sticker, you'll see that it was made in Fayetteville and that's the one you're looking for. :) They have several fabulous scents! At Walgreen's they're sold under the Kathy Ireland brand. Again, if you look at the tag you'll see where they were made and know that they're Hannah's candle company. I've had great luck with these burning well and giving off amazing scents. 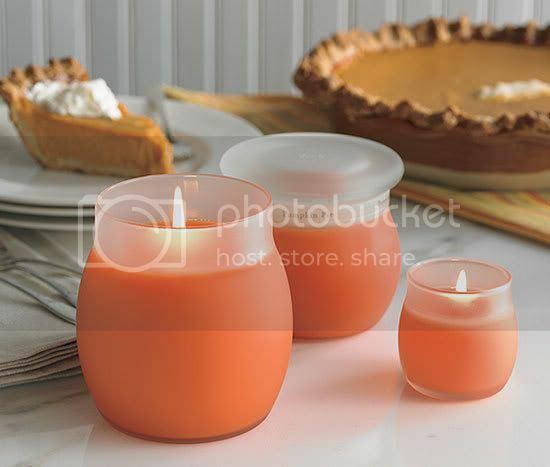 I am burning my Pumpkin Pie candle as we speak (or blog)! Yum! I love candles!! And hey, I only live about 40 minutes from Hannah's Candle Factory, LOL. Small world! The outlet went out of business about 2 years ago. Bummer. Now I have to buy candles at regular price like everyone else! Oh, I'd be in big trouble if I lived near the outlet!! My newest from Hannah's is cranberry orange and I LOVE it!! It's so crisp.